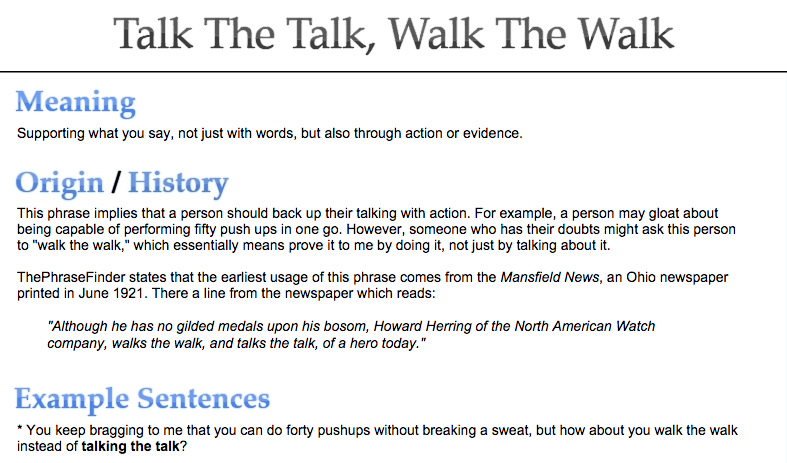 An Invitation: Are You Walking the Talk in Your Content? Now, that is the way to walk the talk. I attended a Vocal Majority concert Saturday. This is one awesome men’s chorus. When the emcee introduced a quartet, I sat up a bit. There, singing with The Essentials was the choir director from my high school. Wow, what a voice. As he sang, I kept thinking: There is a teacher who walks the walk. His presence on the stage, singing first in a group, then in a quartet, and later even as a soloist, shows that he knows exactly what his students must do — and feel — when they engage in activities and performances in the LHS choir. I’ve heard that more than once. Perhaps even a bigger concern than not reading: many English teachers are not writers. The thing that has helped me be a better writing instructor — not attending conferences or classes, not reading pedagogy books — the single most thing that’s improved my ability to teach writing: Becoming a writer myself. I understand the struggle to think of ideas, the headache of revision, the joy of finally getting something right. My students need to know that I know what all of this feels like. Like my colleague the choir teacher, I try to walk the walk of my content. I am an individual intent on improving my literacy skills, just like I want my students to be. I talk about my reading life, and I share my writing life with my students, regularly. I think they trust me more because they know I read as much as I ask them to read. I write as much as I ask them to write, and every major assignment I give to them I write myself (plus this blog and a book I’ve been working on for awhile now.) I even write blog posts about improving my writing: 5 Ways to Meet Your Writing Goals. It is not hard to have credibility. But it does take commitment. Teachers who blog are more likely to 1) reflect on their practices, 2) seek out new ideas for topics to write about, 3) show their students that they practice the craft of writing — like they hope their students will do. So think about it: Do you walk the talk and walk the walk? Do your students see you as an adult with passion for your content outside the classroom walls? I’d like to help you walk a better walk. As I read this post, I feel like I must be doing something wrong. This past year, I spent all my time creating curriculum, grading, completing the paperwork required for our observations, data analysis, writing PARCC questions, completing IEP requests…. And, my husband and kids complained that I was never available on the weekends. Kim, I’m sorry this post made you feel like you “must be doing something wrong.” I think so often the systems we work in have the priorities “wrong,” and we are pushed into doing things that may make us lose our focus. It’s especially problematic when we forget why we wanted to teach in the first place. I hope your frustration stems from the end-of-year blues that get to all of us and that you can look back and see the many bright spot you certainly experienced. Wishing you the best. Love how brought me back that moment. Teachers must read and we must write too. Thank you for sharing your experience. I love your message here Amy. I am a better teacher when I read and write independently simply because I remember why I fell in love with my subject from the first place. I was a reader and a writer before I ever contemplated become a teacher. While it can be extremely difficult to fit in those moments, particularly as a newer teacher when I feel like all my time should go towards grading and planning, I do savor those moments in my day that I intentionally carve out. Ultimately, teaching has made me a stronger reader and writer. I love being able to enjoy books and share them with my students. If I only read the whole class novels I taught, I’d never get to explore the rich world of YA lit. In fact, I probably would never have become as immersed in it as I am now! I was shocked when I heard colleagues say they never read except in the summer when theyy had more time!!! Really, people, as if you had less time than your students who juggle jjust as many responsibilities as you do!!!!! I will always be grateful to a fifth grader who, when I told the class I was going to sing at an Open Mic for the 1st time, “Oh, do it, Miss H. and then you’ll be brave enough to do anything! !” I sang and now I do lots of gigs. So, Do It and then you’ll be brave enough to not only tell your students how to be better readers and writers, but to show them how! And just think of how you’ll improve too! You remind us here about trust; trusting ourselves as writers and readers…and trusting that students will find trust within our walking and talking about all of it. I love this post especially as we start to near the end of our school year; steam sometimes runs low. This is the ideal time to push through, walk, talk, dance…whatever it is that feeds our souls when it comes to writing and reading instruction.